This post is a little different in that the photographs are “wildlife” pictures taken in the small seaside town of Hermanus about an hour and a half’s drive from Cape Town. The first picture was taken quite some time ago using our pretty basic Fuji film Finepix 2 mega-pixel camera with its rather limited 3 X optical zoom. If we had had the newer Cannon S3IS camera with us on that visit we would have been able to do a lot better but the pictures we did get show just what a wonderful place Hermanus is for whale watching. The picture of a Southern Right Whale posted here was taken from the cliffs near the old fishing harbour. This is no longer functioning as a working harbour but has been preserved as a monument and tourist attraction. Close by is a rather unique restaurant, Bientang's Cave Seafood Restaurant, which has been built into centuries old cave in what is probably the best land-based whale watching area in the world. Imagine being able to watch these wonderful creatures frolic in Walker Bay as you enjoy a delicious lunch and sip a fine South African wine in the warm spring sunshine. What a magnificent part of the world we live in. I have read that the whale’s name derives from the fact that it was the 'right' whale to catch, being rich in oil and because it floats in the water when killed. It is estimated that the population of this species presently numbers 3 to 4 thousand. The whales move north during winter and spring to mate, calve and rear their young. 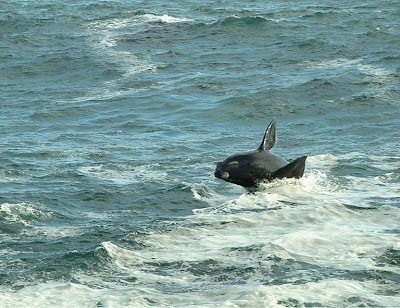 They are usually seen along the South African coast between late July and early December. If you wish to do some whale watching a good time to visit Hermanus is during the Whale and Enviro-Arts festival in September each year. They are supposedly primarily vegetarian although we caught one chewing determinedly on a chicken bone stolen from a picnicker. 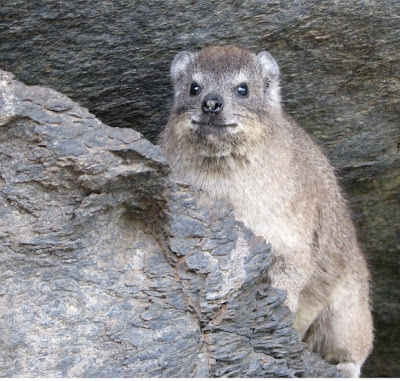 Apparently, the closest surviving relatives of the Dassie are elephants! Great photo of the whale. Reminds me of a wonderful week I spend a few years ago in Hermanus whale watching. Nice to hear from you. We have several more pictures of whales and dassies; one of a Dassie chewing on a chicken bone as mentioned in the text, which we may post later. Hermanus and nearby Onrus are favourite places for us.